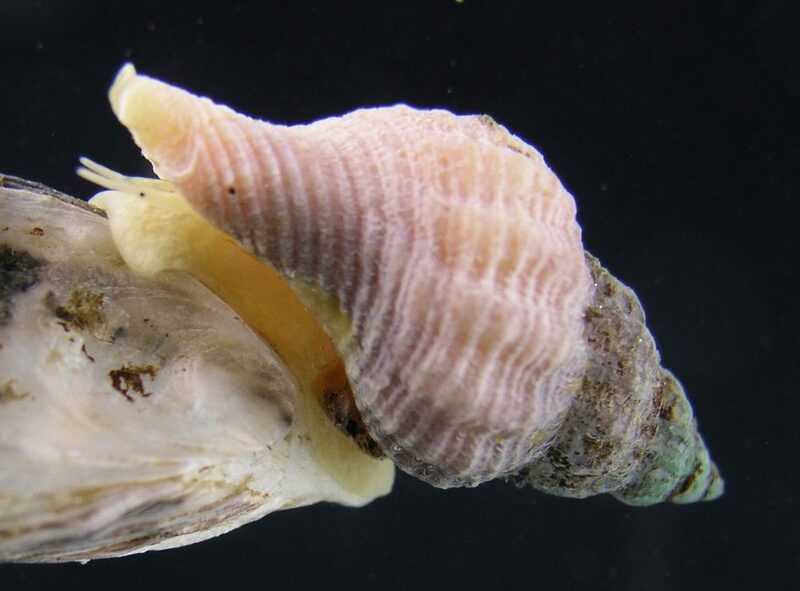 Invasive saltwater snails, including dreaded oyster drills, seem to be far more leery of predators than native snails under certain conditions, according to a new study by Emily Grason, whose research earned her a doctoral degree from the University of Washington. Why non-native snails in Puget Sound would run and hide while native species stand their ground remains an open question, but the difference in behavior might provide an opportunity to better control the invasive species. Of course, snails don’t actually run, but I was surprised to learn that they can move quite rapidly to find hiding places when they believe they are under attack. Like many marine animals, snails use chemical clues to figure out what is happening in their environment. For her experiments, Emily created a flow-through system with two plastic shoeboxes. Chemical clues were provided in the upstream bin, while the reaction of the snails was observed in the downstream bin. The most dramatic difference between native and non-native snails seemed to be when ground-up snails were deposited in the upstream bin, simulating a chemical release caused by a crab or other predator breaking open snail shells and consuming the tender morsels inside. Padilla Bay, an extensive inlet east of Anacortes in North Puget Sound, could become known as an early stronghold of the invasive European Green crab, a species dreaded for the economic damage it has brought to other regions of the country. Trapping sites for crabs (gray markers) during this week’s rapid assessment in Padilla Bay. Red markers show locations where three more invasive European green crabs were found. 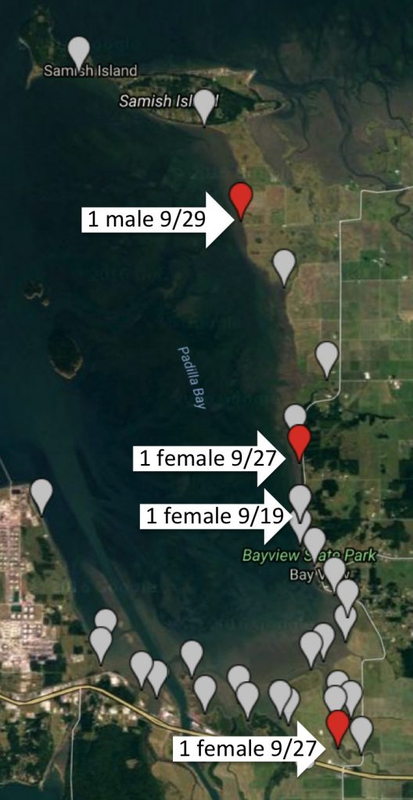 After one young green crab was found in Padilla Bay on Sept. 19 (Water Ways, Sept. 24), three more crabs were found during an extensive trapping effort this past week. All four crabs were captured at different locations in the bay. These four live crabs followed the finding of a single adult green crab in the San Juan Islands — the first-ever finding of green crabs anywhere in Puget Sound. (Water Ways, Sept. 15). In all, 192 traps were set up at 31 sites, covering about 20 miles of shoreline. The crab team was fortunate to work with the expert staff at the Padilla Bay National Estuarine Research Reserve, a group of folks who know the area well and had worked with shoreline owners to get approval for access. Three of the four green crabs caught in Padilla Bay were young, probably washed into the bay during last winter’s warm currents, Emily said in her wrap-up report of the effort. “All of the detections of European green crabs occurred on the east portion of the bay,” she wrote. “Though the sites varied somewhat in the type of habitat, all of the crabs were found relatively high on the shore, in high salt marsh pools, or within a few meters of the shore. 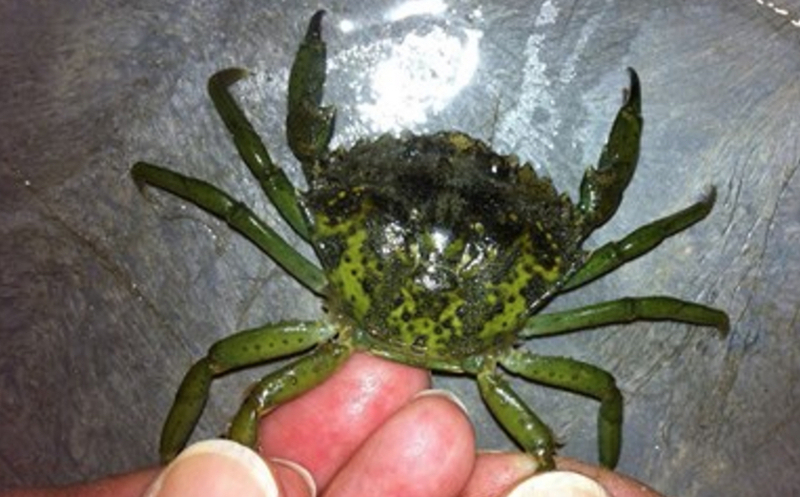 The first of four European green crabs found in Padilla Bay. Yesterday, the response team held a conference call to discuss what to do next. Team members agreed that no more intensive trapping would take place this year, Sean McDonald of the University of Washington told me in an email. Winter is a tough time to catch crabs. Low tides shift from daytime hours to nighttime hours, making trapping more difficult. Meanwhile, crabs tend to lose their appetite during winter months, so they are less likely to go into the traps to get food, experts say. Researchers, shellfish growers and beach walkers are being asked to stay alert for the green crabs, not only in Padilla Bay but also in nearby Samish and Fidalgo bays. 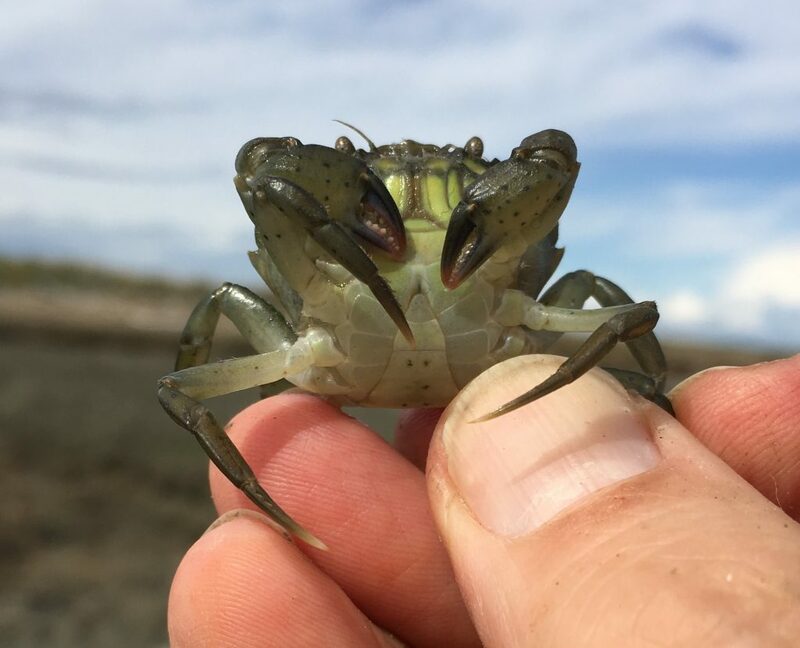 The Legislature will need to provide funding to continue the citizen science volunteer monitoring program, which provided an early warning that green crabs had invaded Puget Sound. Whether the crabs will survive and in what numbers is something that demands more study and perhaps a major eradication effort.